LAKE BUENA VISTA, Fla. -- Donald and Daisy topiaries cruise through a floral tunnel of love while topiaries of Cinderella and Prince Charming "waltz" amid blossoms and greenery. Disney "sweetheart" topiaries based on decades of happily-ever-after classic stories add romance and whimsy to the 13th annual Epcot International Flower & Garden Festival April 21-June 11 at Walt Disney World Resort. Known by gardening aficionados for its celebrity guest speakers, hands-on seminars and planting demonstrations, the seven-week festival will take place in the park's Future World and World Showcase. 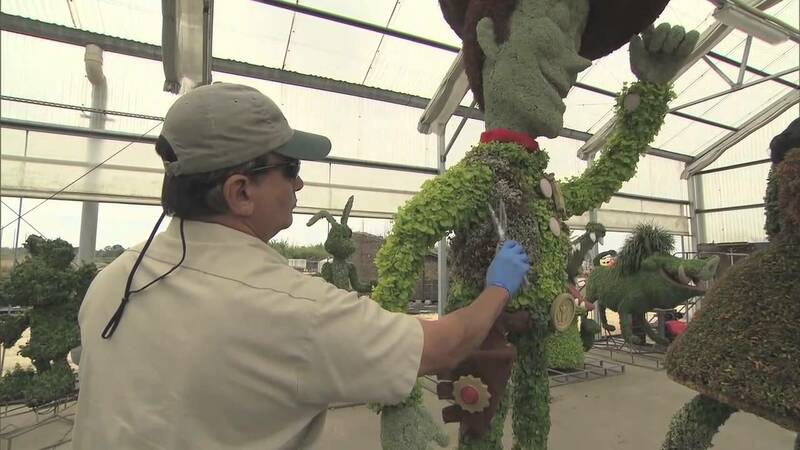 Thirty million blooms, intricately designed floral beds, artfully crafted bonsai trees, lush rose gardens and more Disney character topiaries will grace the park's 300 acres. Nightly Flower Power concerts will rock the landscape with live entertainment from top acts of the 1960s and '70s. Minnie's Magnificent Butterfly Garden, which debuted at the 12th annual festival, will return with hundreds of butterflies in a screened, walk-through enclosure and will include a live exhibit showing how caterpillars form a chrysalis and emerge as butterflies. The Festival Center, where guests can find program guides and festival merchandise, as well as guest speakers and demonstrations. The popular Great American Gardeners series, opening with Paul James of HGTV's "Gardening by the Yard," April 21-23. A "see and sniff" Fragrance Garden at the France pavilion showcasing flowers in several perfumes. Disney Gardening at Home presentations where Disney horticulturists share tips and secrets for at-home gardening. Kids' activities, including the fun-filled Tinker Bell's Fairy Garden and Disney character meet and greets. More information about the 13th annual Epcot International Flower & Garden Festival is available by calling 407/W-DISNEY (934-7639) or by visiting disneyworld.com/flower. The festival is included in regular Epcot admission.